The next three games, on paper at least, present Hearts with a realistic opportunity to extend their run of three consecutive Premiership wins to six by the time August is out. After putting St Johnstone, Dundee and Motherwell to the sword over the past fortnight, the league leaders will be fancied to continue their strong start when, starting tomorrow, they face three teams who finished in the bottom six last season – Ross County (away), Partick Thistle (home) and Hamilton Accies (away). As one of the players who will be expected to provide the attacking flair to open those teams up, however, Sam Nicholson is in no mood to treat any upcoming opponents lightly. The 20-year-old acknowledges that Hearts’ status as one of the biggest clubs in the country automatically makes them favourites for most domestic matches, but he insists that even winning matches in the Championship was a more difficult feat than his team made it look. “The way the club’s gone over the past year or so, the fans are going to expect us to win most games, and rightly so, but it’s going to be hard,” Nicholson said. “Whether it’s teams at the top of the league or the likes of Ross County, Partick and Hamilton, we can’t underestimate anybody. They’re all going to fancy their chances of beating us. We’ve just got to keep the focus and keep the confidence high. “We’ve always got to believe we can win every game we go into, but we know every game in this league is hard. It was the same last season. We were expected to go everywhere and beat teams, but pretty much every game was hard, even though we won some more comfortably than others in the end. When teams are playing Hearts, they raise their game, so it’s really hard to beat them. Hearts won 29 of their 36 matches in the Championship last season and have managed to maintain the winning habit in the top flight with three wins from their opening three games. Belief levels are soaring as they prepare to visit a Ross County side who finished last season strongly and have started the current season in decent fettle. Hearts’ perfect start to the season has drawn comparisons with the vintage George Burley team which started the 2005/06 campaign with eight consecutive victories and went on to finish second in a strong top flight before winning the Scottish Cup. Nicholson, who was just ten during that magical period for the club, said: “I remember that season well. To be compared to that team is flattering. The whole mood about the club seems similar with the sell-out crowds and the team winning games regularly. 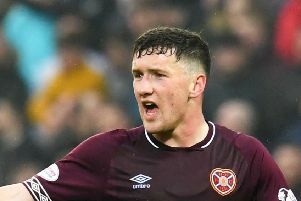 Nicholson has been one of the stand-out performers in Hearts’ bright start to the season. He is wary of getting ahead of himself, however, after a strong opening to last season petered out. “I’m happy with my form so far, but at the same time I started last season really well and then died down a bit, so I’m conscious of the fact I need to keep it going. I don’t want to drop my standards but I’m still young so I know I could hit another form dip. These are good times to be a Hearts player. Since March 2014 – the tail end of the relegation season – the team have won a remarkable 37 out of 47 league games. With fans packing out the stadium most weeks, as they did against Motherwell on Wednesday night, Nicholson admits the buoyancy around the club is inescapable. “Like last season, it’s all still really positive in the dressing-room,” he said. “We don’t get the day off after a game so when we come in in the morning we’re all still buzzing from having got the win the day before. It’s a really good atmosphere about the place. Even before games, all the boys are buzzing. As a player, arriving at the ground with the sun beating down, knowing you’re going to be playing in front of a full house and have the chance to go top of the league, it’s a big buzz. You want to win every game you play, but when it’s like it was the other night, it gives you a real lift.